"Trash and recycling fees are going up due to international struggles with plastic disposal. 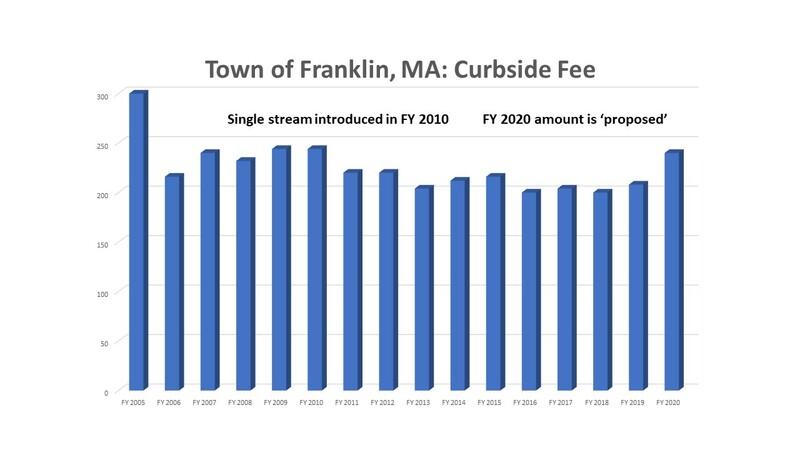 Town councilors approved a rate hike of $32 on March 20, raising the average annual cost for curbside trash and recycle pickup to $240. The council also voted to raise the price of stickers in 2020 from $25 to $35 for the transfer station on Beaver Street. Franklin recycles about 3,600 tons of waste a year. 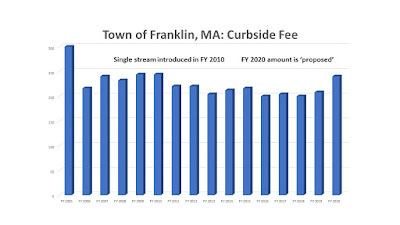 The cost will rise to $55 a ton in 2020, $20 more a ton than the town currently pays. The town sold around 240 stickers last year, but is considering either eliminating the option or increasing the 10-day fee to $25. In the last year, China has been sent massive amounts of plastic waste for recycling purposes. According to NPR, about 106 million metric tons, or roughly 45 percent of the world’s plastic ready for recycling, was exported to China. Inundated with the waste, the country decided at the start of last year to decline any more shipments." Note: The first of two votes to approve the rate increase was held on March 20. The second vote is scheduled for a future Town Council meeting before becoming effective July 1. While the fee is increasing, we are still below where the fee was in 2005. "The planned facelift for one of Milford’s most heavily traveled roads remains on track to begin this fall. The half-mile stretch of Rte. 16 from just past the Milford police headquarters to the Hopedale town border will receive a long-awaited upgrade. The project will focus on the intersection of Rtes. 16 and 140 near Milford Regional Medical Center. The intersection is a regular spot for traffic backups and will be widened to make way for dedicated turning lanes, which should ease the turning radius for large trucks and tractor-trailers. New modern traffic signals with preemptive control for emergency vehicles approaching the intersection are part of the project."